Warm, family restaurant worth the trouble to find. Tucked in some corner in the old market area, we took some time to locate it. 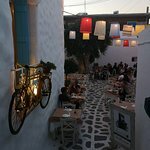 Due to low season, we were the only customers during dinner time in warm, friendly setting. We had tomato soup, warm bread with butter and herbs, signature apostolis mussels with garlic butter and zucchini croquette. We enjoyed all dishes which were excellent. We would definitely recommend this place. 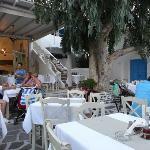 Dined here 2 nights while in Naxos, Sept 6 and 8. 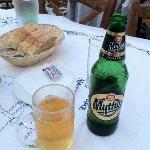 Both times the food was excellent, the beer cold and an excellent wine list. Cost $75 euro for 2, which included 2 starters, 2 mains, 1 beer, 1 water and 2 bottles of wine, and the staff loaned us 2 wine glasses and an opener to take a bottle of the wine back to our accommodation (which we returned the next day). We found the wait staff excellent and attentive. 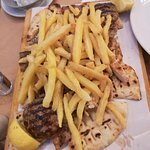 Delicious food, particularly the kleftiko and moussaka. We have eaten here as a family over the last four summers and have always enjoyed. Yes service can be a little slow, but is that really a problem when you can sit with a jug of wine on a warm summer' s evening? Worth seeking through the little passages. Don't miss the original bakery just around the corner. This was disapointing and I would not recommend this restaurant nor would I make a second visit. 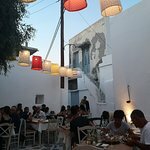 The service was poor, not friendly whatsoever which is very surprising given the Greek econimic situation at the moment - I had expected excellend service. The restuarant was also not good value for money. They are trading off the venue and setting which looks romantic. The food was poor, the beef stew was over cooked, dry and portions were very small. My partner had the stuffed burger which was a better choice than the stew. 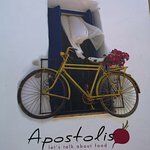 Been to Apostolis? Share your experiences!